Material: 52% Nylon, 31% Polyester, 13% Cotton , 4% Spandex. Material: 52% Nylon + 31% Polyester + 13% Cotton + 4% Spandex. 1. “Y” Shape Heel Design: Comfort for your heel and prevent slipping. 2. Ventilation and Deodorant Design: With knitted mesh to help the elimination of moisture. 3. Sole Design: Thin looped pile design, cushioned and protected. 4. Whole Sock’s Supporting Design: The whole scoke is of Lycra and Spandex to fit for your foot. 1. Sweating: Use quick dry and breathable material, combine with the mesh design of the well-developed foot sweat glands, accelerate the leakage of moist and hot, and help discharge peculiar smell to keep the feet clean and comfortable. 2. Cozy Fit: With well elastic and is close fitting. 3. Non-slip: Excellent functional elastic fiber to provide comfortable wrapping feeling. 4. 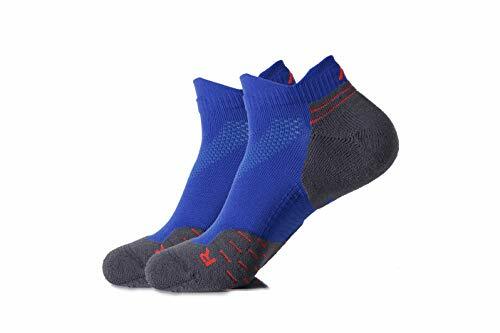 Protecting and Damping: The bottom of the socks provide enough support, and the heel design protects you enjoy the sporting. 5. Functional Fabric Material: The wear-resistant Composite Functional Fiber combined with Lycra Functional Fiber endows the socks with excellent durability and is not easy to deform. 6. Fine Details: Close suture, seamless integration, smooth and soft, do not rub the feet.